In this tutorial, I explain the 5 quick ways to delete duplicate records from any database table. These ways must be known to every developer. When you are working with Database-Driven applications, you should definitely know how to remove duplicated records from your database table. Duplicate records not only take a massive amount of space but also make the database query execution process slower. Therefore, every developer should know how to delete duplicate records. I have decided to write this tutorial that tells 5 quick ways to delete duplicate records from a Database table. I hope you will enjoy reading and learning from it. You can create this table by running the following script in your SQL Server Database. Ram with id 2 and 3. 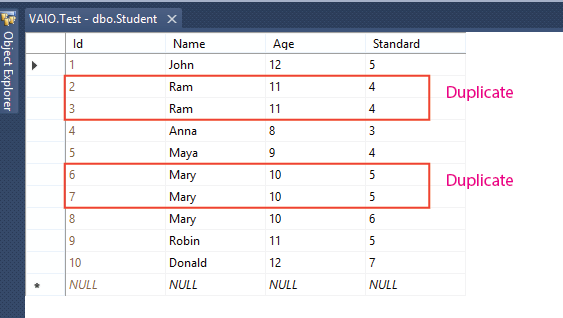 Note that the student with name Mary and Id 5 is not a duplicate of other Mary records (id 6 and 7) because her standard is different than other Mary records. 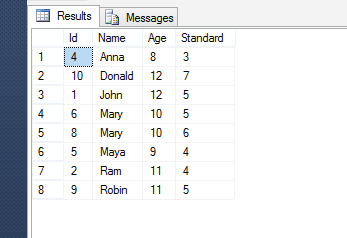 SQL Group By statement groups the results by one or more columns and is used by with aggregate functions (COUNT, MAX, MIN, SUM, AVG). You can see in the above image that the students with id 3 and 7 are missing since they are the duplicate records. After running this query, the table duplicate records get deleted as shown in the below image. If you want to use Distinct Statement which returns Non-Duplicate rows then you will have to create a new table with an exact definition like your previous table. Then insert all ‘Non-Duplicate’ rows from the previous table to the new table. Let me take the help of Entity Framework Core which is an OR/M(Object-Relational Mapping) framework written in C# language. Entity Framework Core is widely used in ASP.NET Core database programming. 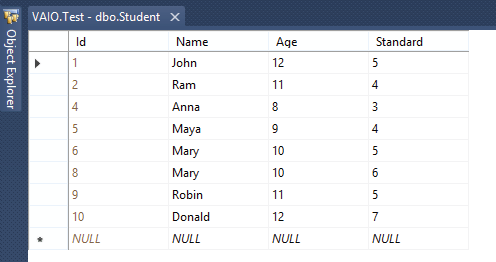 I have used GroupBy() function of Entity Framework Core to find out all the duplicate records based on 3 columns - 'Name, Age, Standard'. Next I use the RemoveRange() method to delete these duplicate records. Notice the Row_Number() function which provides consecutive numbering of the rows in the result by the order selected in the OVER clause. It will assign the value 1 for the first row and increase the number for the subsequent rows. I have put the 3 columns of the Student’s table in the Partition By statement. When you specify a column or set of columns with Partition By statement then it will divide the result set into record partitions and then finally ranking functions are applied to each record partition separately and the rank will restart from 1 for each record partition separately. In the ‘on’ condition you check the duplicate columns. In the ‘where’ condition you compare the ‘primary key’ columns of the tables. In this tutorial, you learned 5 quick ways to delete your duplicate records from a database table. You can choose any deletion method based on your liking. Don’t forget to like this tutorial and share it with your friends.